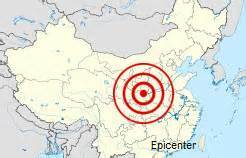 Shaanxi Earthquake (1556) - The Shaanxi earthquake is the deadliest natural disaster in history (in terms of loss of life in a single day). It killed an estimated 830,000 humans, or approximately 60% of the population in the Shaanxi province. Though magnitudes were obviously not measurable at the time, it's believed to have been about an 8.0. In some places, 66 ft (20 m) crevices opened in the earth, and the quake triggered landslides that contributed to the incredible death toll.